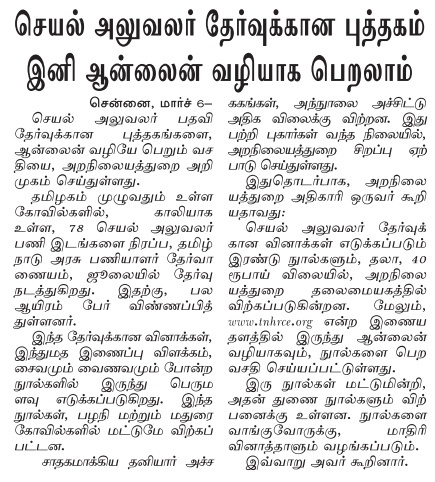 TNPSC Recruits Executive Officer Grade III and Grade IV included in Group-VIII Services Exam 2016-17. 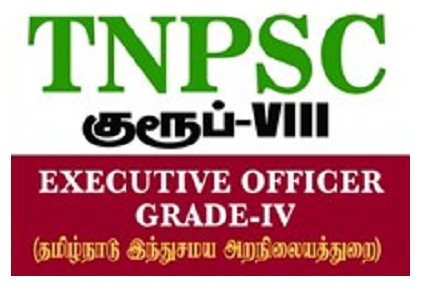 Applications are invited for TNPSC (Tamil Nadu Public Service Commission) Executive Officers in Tamil Nadu Hindu Religious and Charitable Endowments Subordinate Service and Tamil Nadu Hindu Religious and Charitable Endowments Subordinate Service. The Notifications Published today 25.11.2016, for the Posts Executive Officer Grade-III (Total Vacancies 29) and Executive Officer Grade-IV (Total Vacancies 49). The Applications only through online mode upto 24.12.2016 from applicants professing Hindu Religion only for direct recruitment against the vacancies (2014 - 2015, 2015 - 16 and 2016 - 17) for the post of Executive Officer, Grade-IV included in Group-VIII Services. Only persons professing the Hindu Religion (as required by Section 10 of the Tamil Nadu Hindu Religious and Charitable Endowments Act- 1959 (Tamil Nadu Act 22 of 1959) are eligible to apply). Paper - II - 29.04.2017 - 2:30 P.M. to 5:30 P.M.
Paper - II - 30.04.2017 - 2:30 P.M. to 5:30 P.M.
Commerce ....of any University recognized by the University Grants Commission. (i) The qualification prescribed for this post should have been obtained by passing the required qualification in the order of studies 10th + HSC or its equivalent + U.G. degree. Provided that, other things being equal, preference shall be given to employees of Religious Institutions (other than Government Servants) who have put in not less than 5 years of Service. (i) The higher qualification claimed to have possessed over and above the prescribed for this post should have been obtained by passing the required qualification in the order of studies 10th + HSC or its equivalent +U.G. degree. ii) Oral Test in the form of an interview. Final selection will be made on the basis of the total marks obtained by the applicants at the Written Examination and Oral Test taken together subject to the rule of reservation of appointments through Counselling. Appearance in both the papers of the Written Examination and Oral Test is compulsory. An applicant who has not appeared in any one of the papers in Written Examination or the Oral Test will not be considered for selection, even if he secures qualifying marks in the Written Examination or Oral Test.